Isn't the internet an amazing place? Things that I never thought were possible have happened thanks to the internet - above and beyond even the Hamster Dance! Specifically, thanks to the combined efforts of people with mutual interests and the magic of "networking", the darnedest things have come to light. When I'm in the pit of despair that I'll never know, for example, what the opening lineup of shops at the Walt Disney World Village is, similarly obsessed friends have come through for me. When I doubt that I'll ever find that 1984 EPCOT Center guide map for sale, eBay has come through for me. Forum topics have even taught me a thing or three about the Haunted Mansion, a topic that obsessed and seemingly exhausted my efforts to research it for around six years of my life. It's wonderful to know that through pure force of numbers, we, the Disney obsessive, will apparently one day write the history of the Disney company for them, in great detail, with no input or even request from the company themselves. I say all of this because one of the reasons for my ongoing series on "Park Mysteries" is to get the questions out there in easily corruptible zeroes and ones in the hope that someday my boat will come in. A relatively benign mystery, number two, was solved in relatively short order. Since then I've been working studiously to post ever more obscure Park Mysteries, knowing they're even less likely to be solved. But one has, and it was a big one for me. Over a year ago, I posted Park Mystery #6, a fairly conjectural piece about a little noticed missing building in Liberty Square. This was so obscure I doubted I would ever get an answer, but thankfully, as I have introduced already, the internet is amazing. The first few significant new leads came in the comment responses to that post, where GoofyDude pointed out that the building can be observed in several Herb Ryman concept paintings for Liberty Square - along with most of the other significant architectural details in Liberty Square, although sadly his windmill didn't make the cut. Neither did what was referred to and what I have begun to think of as the "Old North Church", albeit with an outside flight of steps (which people can be seen standing on in the Ryman piece!). The identity of this building was rather impossible to guess at, given its' location and the comparative glut of food and merchandise options around it. I had gotten fairly used to thinking of it as some sort of multilevel exhibit space, until a few days ago, of course. So here's the solution, taken from a 1971 blueprint, photographed by an eBay seller, saved by Mike Lee, and forwarded to me. As can be seen on the below blueprint detail, the building is labeled "Market Place". Hurrah! Of course, as ever at Walt Disney World, the story only starts there. And the story of this little non-building is woven very strongly into the story of forces that would shape the Magic Kingdom is very significant ways. First of all, let us say that "Market Place" could mean just about anything... a shop, a counter service location, a fruit market. I'm fairly convinced that it would be some sort of small, walk-in food grab, and there are lots of reasons for this despite the proximity of the Sleepy Hollow counter service location with its' opening day menu of prepackaged sandwiches. Most of the Magic Kingdom's food locations weren't ready to go online in October 1971. 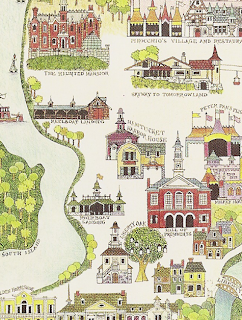 The Columbia Harbour House, called "Chicken & Fish" on most Magic Kingdom blueprints and later labeled the "Nantucket Harbour House" on 1971 souvenir maps, wasn't ready to go until the first quarter of 1972. Nearby, Pecos Bill Cafe in Frontierland wasn't fully operational until late November and the Mile Long Bar wasn't even open until November 15. 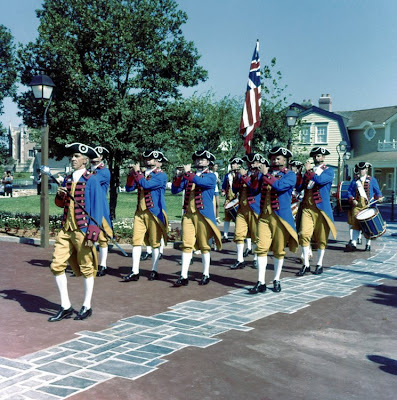 Disney continued to add dining options in 1972 - see The Fife & Drum at Widen Your World - and 1973 and 1974, with Aunt Polly's on Tom Sawyer Island and the El Pirata taco bar in the brand new Caribbean Plaza. 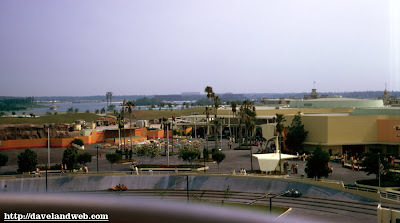 So this "Market Place" was likely meant to add just another food option in a park that was barely ready to greet paying customers in 1971 - the Admiral Joe Fowler opened a day late, for example.... 20,000 Leagues Under the Sea was still under construction, and the Grand Prix and Skyway Station were the only attractions open in Tomorrowland (American the Beautiful opened in November and Flight to the Moon in December). The Magic Kingdom was so in need of food options that they cut a hole in the construction wall which was the bulk of Tomorrowland, pulled up a trailer behind it, and served food out of there next to the similar hole with glittery foil curtain which acted as a "stage". So why was the Liberty Square Market cut during construction? As we know, Disney substituted a little seating area and planter for the Market, which was in place for the opening of the park. If so little of the park would be ready for opening day, why make the problem worse by cutting a strategically placed food location? The answer: money. As anybody who's read Married to the Mouse or Realityland knows, the construction of the "Vacation Kingdom of the World" was an embarrassing fiasco. Fort Wilderness wasn't built so much as stolen. The Polynesian was dramatically scaled back early in the planning stages. 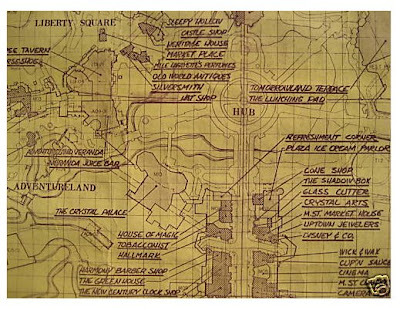 Most of Fronteirland's attractions were cut, as were three hotels and the bulk of Tomorrowland was not yet decided on. Even fairly fully realized projects like the Jungle Cruise had elements intended to be installed later, as documented on Widen Your World, and the best Disney could do to prepare for the future was to put up some basic infrastructure to support future additions, like the spur line abutting the Jungle Cruise maintenance bay which would one day house the Swan Boats. Who knows if they even were planning on having such a thing two years earlier. 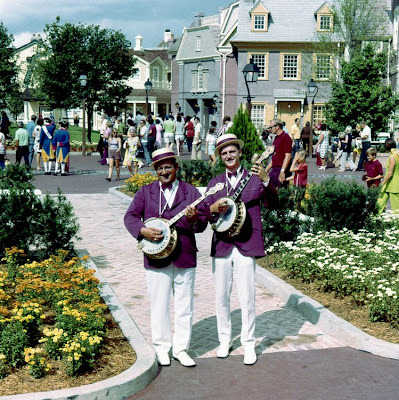 Thus, the Liberty Square Market esentially "became" the Fife and Drum a year later, Disney likely not wanting to interrupt park operations in a major pedestrian zone at this point. But this is not, of course, the end of the story. In 1971, Disney was ill prepared to deal with the heat of the Florida sun and the high demand for several of their attractions, and so in 1972 several ongoing queue modifications went into effect. Country Bear Jamboree absorbed a nearby shop, a canopy was built outside the Haunted Mansion, the Jungle Cruise sprouted a whole new building to the east of the original boathouse while the original upstairs queue was retired, construction began on a second riverboat to meet demand, and the Hall of Presidents grew a queue. The original Hall of Presidents look featured a flat brick facade with three windows directly above three doors into the waiting area, as seen below. By 1973 the familiar white veranda, breezeway, and queue had grown onto the building. As the number of attractions in the Magic Kingdom swelled and the popularity of the Hall of Presidents declined, the queue went through a number of new uses. 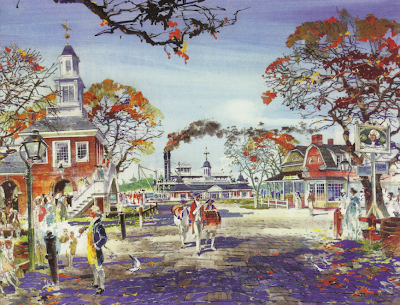 It had already carved out a portion of the Liberty Square green, which filled the area between the side of the Hall of Presidents and the Columbia Harbour House and can be seen below in a 1971 promotional photograph. Since it's likely that all but the most familiar with the Magic Kingdom will be confounded by this photograph, I'll go into very specific detail. Our Banjo Duo - Pat Terry & Son - are standing right in the seating area which was the replacement for our Liberty Square Market, directly behind them is the future location of the Hall of Presidents queue, and the photographer is standing in the dead center of the little seating area where the Liberty Bell is today. Just out of sight to the right is the Hall of Presidents facade. But back to that green: it existed in some form or another for perhaps another decade, before being paved and turned into the series of circular planters and tables which can be seen today. The reason is anybody's guess, but the huge hedge today planted around the Liberty Tree is a clue: Disney probably didn't like guests dragging themselves all over the landscape, as they were and still are apt to do. In 1989, Disney purchased and installed a replica of the Liberty Bell right where that photographer snapped the above photo eighteen years earlier. 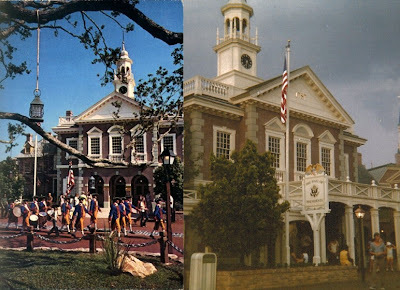 In 1991, probably due to heavy tree growth, the original Court of Flags which prefaced the Liberty Square bridge of 1971 was moved to surround the Liberty Bell and the Bridge area was rebuilt to include the brick walls, plaque, sign and guardhouse that can still be seen there today. The historically-minded Disney fan can still find the holes for the flagpoles still there today, incongrously filled with stanchions. And so Disney's quick replacement for their Market way back in 1971 had finally developed a purpose. Throughout the 1990's and early 2000's the Hall of Presidents queue hosted Liberty Square's fleet of portrait artists. In 2003, Food & Beverage made a move to take over this location and turned it into... a little food market. And so history has finally turned in on itself: in 1971 Disney decides to not construct a Market for the purchase of fruit or quick snacks due to cost overruns. Thirty-Eight years later, ten feet away from the site of this cancelled building and through strange circumstances, is this very same market. Whether we advocate demolishing the Hall of Presidents queue and finally realizing Herb Ryman's evocative little building at the corner of the two major thoroughfares in Liberty Square at this point is thoroughly subjective. But the irony, echoing down through the years, is delicious and undeniable. A few weeks ago, the most significant part of my experience of Walt Disney World to recently close, did close - no... not as important as something like El Rio del Tiempo, but so much of my life in Orlando included trips to and from and including Virgin Megastore that I still haven't really come to realize how much less reason I'll have to visit Walt Disney World now that it's gone. Even if I didn't have much reason to want to buy anything, to Virgin I went anyway - to loiter, look and shop. When I initially had moved to Florida and had no way to visit the theme parks I spent nearly every other day at 'Downtown Disney' just to feel close to the place. 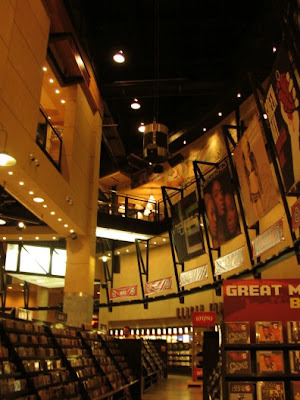 Above: Virgin Megastore Orlando's cavernous two-level interior, taken near the vinyl section. The illuminated triangle is the bottom of the "Virgin Radio" booth. 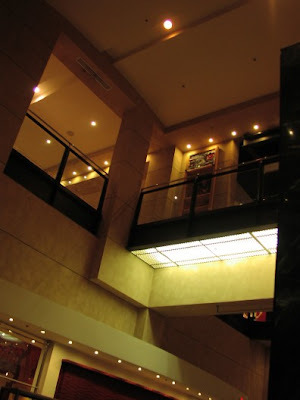 Below: The double escalators bring you to the second floor. Virgin was my only reason to trek across to the tedious West Side from the Village, and I had been there so often since 2000 that I can actually remember and feel nostalgic for the original incarnation of the store, well before DVDs exploded everywhere, video games were still upstairs and that big hydraulic stage above the door outside was used for concerts. I don't have too much documentation of that version but in any form Virgin was a big part of my life, often the only place around to find new DVDs or records or whatever media it was I was after. It's safe to say, by dint of their location, selection, and hours, that I went there more often than any other component of Walt Disney World in my leisure time. 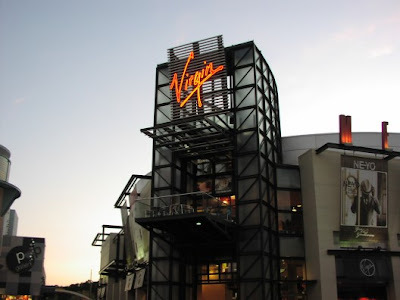 Although the Virgin retail store brand has not been totally closed, its' removal from the United States market is unfortunate, especially in light of the fact that the Virgin brand began as a record store back in the early 1970's. In the US we have only contact with the Virgin uber-brand in passing, but the two dozen Virgin Megastores littered around the continent did seem like neat experiences if you could live near or just visit them. You could only really find a Virgin Megastore in major markets, and even in the waning years of their selection and layout - after clothes had taken over most of the ground floor and the children's section had been gutted and weirdly relocated - there was still plenty of reason to stop by and see what Virgin had got in stock, although the likelihood of them having what you wanted had greatly diminished. 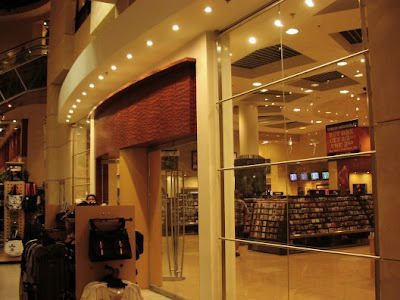 Several years ago I spent a few Monday summer evenings haunting the store until it reached midnight and everyone could queue up to buy the new releases of movies or music; in those days Virgin had a loyalty program as well. When the reward card was canceled and the selection began to stagnate, the writing was arguably on the wall... three years ahead of closing. But Virgin Orlando was successful, despite internet rumors to the contrary. On the busiest weekends the ground floor could be filled to capacity, and the number of domestic and foreign tourists you would see dropping thousands on audio-visual on a routine basis was pretty staggering. Most Disney guests may have stopped at the CD or DVD to keep the kids sated, but seeing one of the rich Brazilian fathers putting down money on something like twenty Blu-Ray discs wasn't too uncommon either. I once saw somebody in the vinyl section buying something like thirty records at once, including duplicates of several titles. My only guess was that he was a DJ planning on wrecking them all on his turntable. 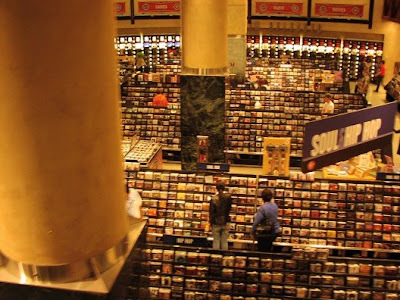 Below: the enclosed Classical / Jazz section. No, it's not significantly quieter. Right: The 'Coco Moka Cafe' on the second floor, with balcony seating outside above the main entrance, served "Seattle's Best Coffee"
Now that Virgin has departed from Downtown Disney and management has closed and gutted much of Pleasure Island, I feel that now is the time to come to terms with how much of a wreck Downtown Disney is. Although the rebirth of Pleasure Island was a long and painful time coming, Disney managed to close everything to do in that area just a few weeks before the really serious market panic set in last October. Since there was only one new tenant ready to move in at that time, Pleasure Island's "new direction" is becoming a long, depressing joke. Although successful to be sure, the new T-Rex restaurant is in the most suspect taste imaginable and only further blocks your view of the Empress Lilly. Now that the tenancy of the McDonald's at the Marketplace may be finally ending, Disney is in a real bind as they have too much empty space not filling in at Downtown Disney and it's only going to get worse the longer it sits. While Pleasure Island is being reworked, Disney also needs to address the depressing slate of stores available in the West Side. The West Side area itself is sort of a mess, a basic expansion of stores along the side of the existing AMC theaters which have failed to inspire much in the way of interest. 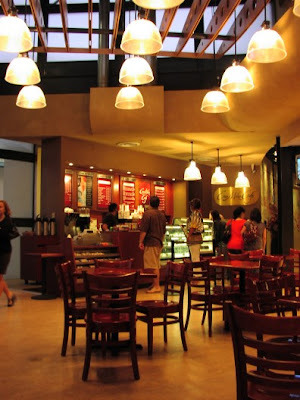 In the early days of the West Side, sandwiched between the Starabilias store and the Candy Cauldron location was a retail store promoting the "Official All-Star Cafe" in the upcoming Wide World of Sports, which was marketed as being something similar to Planet Hollywood in that it was an eatery owned by sports stars like Wayne Gretzky and Shaquille O'Neal. 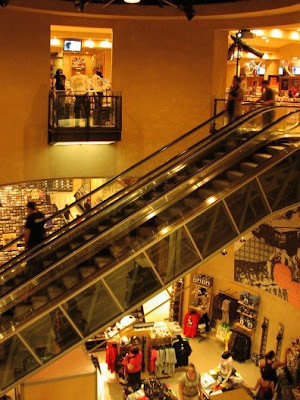 Shortly after the Wide World of Sports opened in 1998, the "preview" location closed and was replaced with another "Planet Hollywood on Location" store, making it the second Planet Hollywood store within short walking distance of the Big Blue Ball itself, which already sells merchandise inside to begin with. Another MIA tenant was to be a merchandise store for the Orlando Copperfeild Magic Underground, a project which was cancelled in late 1998 and which required Disney to open the depressingly slapdash Mickey's Groove store in its' place. Both of these tenants could and should be easily removed and replaced with more inspiring locations. Right: the view from the balcony. It could lower to ground level to become a stage. 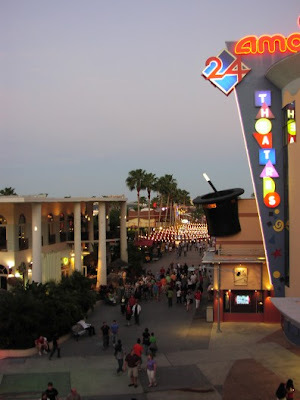 What Disney really needs to do is make true on their promise of "Downtown Disney" and craft from Pleasure Island and the West Side an inviting open air environment for strolling, shopping and eating. The Village still has this due to the still-remaining wisdom of that layout and design from 1975, and it is the truly busy heart of the Downtown Disney complex because the urban design concepts it was designed to uphold in the mid 70's are still valid and appealing. The skeletal structure of what Disney has in place with Pleasure Island and the West Side isn't so bad, but they need to attend to the needs of guests who have been increasingly stranded on property thanks to the "Destination Disney" concept. Despite the kitchens installed in the revamped Treehouse Villas, guests have no grocery store to buy food at. They have no bookstore to browse. They don't even have an affordable sidewalk cafe or coffee bar to stop by. The solution for the future of Downtown Disney is in the past of the Walt Disney World Village. The key is in diversifying the offerings of one of Disney's cash cows and doing it tastefully. The most ironic thing is that this is the sort of thing that Disney had on property until the mid 1990's, their own unique design, and it's now being done better by everyone except Disney themselves.